The restricted volume of wetted soil under trickle irrigation and the depth-width dimensions of this volume are of considerable practical importance. The volume of the wetted soil represents the amount of soil water stored in the root zone, its depth dimension should coincide with the depth of the root system while its width dimension should be related to the spacing between emitters and lines. Thus, the volume and geometry of the wetted soil under an emitter should become an objective rather than an end result of the design process. The purpose of this paper is to introduce and demonstrate an inverse design process, where a management-controlled wetted soil volume, Vm, is estimated first. The parameters which influence the value of Vm are the available water holding capacity of the soil and the peak daily crop water use representing specific field conditions. 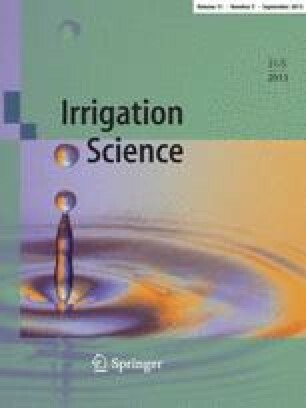 The irrigation interval and the management-allowed deficit are additional parameters which affect the wetted volume and could be changed depending on crop sensitivity as well as water and irrigation equipment accessibility. A truncated ellipsoid is assumed to best represent the geometry of the wetted soil volume under an emitter. Pairs of possible depth-width dimensions which satisfy the estimated volume of the wetted soil are then computed using the equation of a truncated ellipsoid. Finally, depth-width-discharge combinations which can yield the estimated wetted soil volume are computed using an equation proposed by Schwartzman and Zur (1986). The most suitable combination based on local irrigation practices and available emitters is then selected. Computational examples for three soil types under the same climatic conditions are presented and discussed.